After several years of planning, the city of Slidell, Louisiana, expects to begin building its new marina at Heritage Park sometime this summer. The new marina will include 40 slips, with nine back-in spaces and 30-plus slips along a 600-foot concrete floating dock. Slidell is located at the headwaters of Bayou Bonfouca, about six miles north of Lake Pontchartrain. 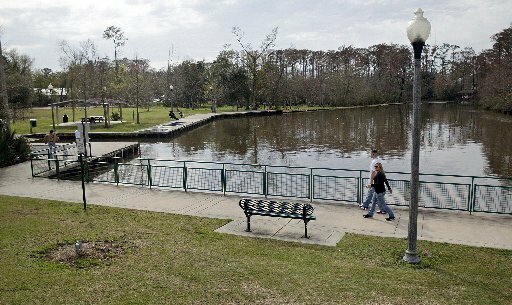 “The bayou is a navigable waterway that runs nine to 12 feet deep all the way up to Heritage Park,” said Slidell City Councilman Bill Borchert, a boating enthusiast who first read about the BIG grants and spearheaded the marina project. Heritage Park has an amphitheater where the city puts on a Bayou Jam concert series each year, but a metal fence designed to keep children out of the bayou also blocked access for boats. Borchert was able to obtain a $1.5 million Boating Infrastructure Grant from the U.S. Fish and Wildlife Service for the city, which will contribute approximately $900,000 of its own to the project. Although the city of Slidell won the federal grant in 2012, it had problems getting the state to sign off on land use paperwork. With the necessary signatures finally in place, engineering work has started and the city expects to put the marina project out to bid sometime this summer. Work should start in September, and the marina should be ready to welcome its first boats in March or April 2017. The work will include replacement of a rotted metal bulkhead installed back in the 1980s. All of the docks will have power and water and access to a pumpout station. The park already has restrooms, but the city will also add a shower and bathroom area for marina guests. The marina will not offer annual or monthly rentals, and will limit the overnights at all the docks to 14 nights. Borchert said the city envisions sailing clubs and others coming in to the marina for a weekend or for several days to enjoy the amenities of the city, including the several restaurants within easy walking distance.